Change your “current city” to your target city. 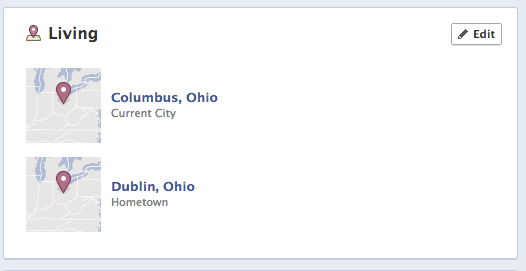 If you’re aiming for an event in Columbus, Ohio, change it to Columbus, Ohio. Don’t worry, you’ll switch it back shortly. 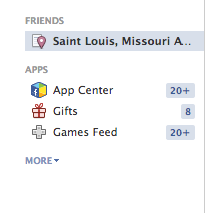 Go back to your Facebook home page and locate “Friends” on the left sidebar. Click on the city you just changed to as your current city. Click “Manage List” on the top-right corner and then choose “Edit Radius…”. 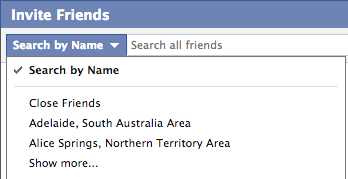 This is where you group all your Facebook friends within a certain radius around your target city. Choosing something like 50 miles or so is probably best. You can change your “current city” back to your actual city you’re living in. The hard part is now done, so let’s start inviting people! Head to the event where you want to invite your friends. Go to invite them like normal, but on the invite pop-up, where you actually select who to invite, click on the “Search By Name…” button. A drop-down will show, and the first “group” of options will be all the cities you’ve done this for. Select your target city and all your friends in that radius you determined of the chosen city will show up! No more needing to go through all of your friends to select the specific ones you want at your show. If you’re smart, you’ll have a plugin installed on your browser to invite everyone in one click. That’s it! Use this to invite people who actually may come out to your event. You can use this for every city you may be stopping by, and it appears that there’s no limit to the amount of cities you can do this with. Your Facebook friends who live far away thank you.